Blogger vs. Wordpress.com: Which Is Best For Your Blog? Two most popular ways to create free blog on internet through blogger and wordpress. Blogger and wordpress are great blogging platforms to create free blog with sub domain or your own domain so bloggers are confused which blogging platform they used Blogger or Wordpress? Both of them are great blogging platform which used widely all over the world and if you are beginner to create your blog then both are great for this. Blogger or Wordpress? It's a question that faces all blogger when they start their blog. I have used both Blogger and Wordpress for years and I have good idea about both platform of their benefits and drawbacks. I am providing you feature of both Blogger and wordpress which is help to find best blogging platform for you. It’s give you free blog. 3GB free storage for media and post. Connect your blog with social networks. Access wordpress from Mobile (iPhone, iPad, Android and BlackBerry). Custom Design with $30 per year. Custom Domain with $13 per year. VideoPress for uploading your own videos. If web hosting price fit for you then wordpress is best choice for create your own blog. This doesn't mean that blogger is not good option it is good option for those users which want create free blog without spend money on hosting. 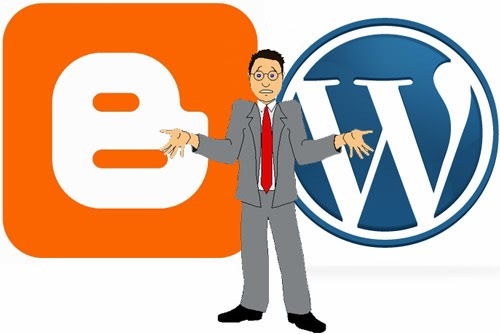 Blogger's is limited features as compare to wordpress but blogger is best for beginners.